Welcome to asktooltalk.com's Press Room! Newsworthy items and other items of importance will be posted here. You may copy and print or post the press releases below provided that each release's closing line, which contains our web site's address, is included with the release. Asktooltalk.com has undergone a complete redesign in 2006, its first since it entered cyberspace in September '98. Information has been reviewed and updated, links and other information have been reverified, and the site now features a revamped General Store. "Asktooltalk.com exists to serve its monthly 90,000-plus site visitors who need solid home improvement and construction information, and I believe they will find this new site much more user-friendly. A wealth of reliable home improvement and construction information is readily available, and the site continues to grow," says Leon A. Frechette, President of C.R.S., Inc., and guiding force behind asktooltalk.com. Featuring articles about home improvement projects, tools, products, and woodworking, asktooltalk.com also contains tool and product reviews to help consumers make informed choices. Visitors seeking answers to specific questions can search FAQs and Q&As for situations that closely resemble their own. The site's General Store offers a variety of hard-to-find tools and home improvement products. Tool Pro Leon A. Frechette provides the construction expertise behind asktooltalk.com. The author of seven books about remodeling and construction, he has spent over twenty years in the construction industry and has written over 100 articles for over a dozen magazines. He has toured home and garden shows in the U.S. and Canada with his popular "ToolTALK" and "ToolTALK for Women" presentations. Over the last two years, he fielded questions for a weekly newspaper column. To learn more about Tool Pro Leon A. Frechette, guiding force and construction expert behind asktooltalk.com, click here to read his short bio and here to read his full bio! "Measure twice, cut once" is an old woodworking adage to avoid incorrect cuts and the waste of time and materials that result from them. A good tape measure is what you need to "measure twice." Whether you're building a house, creating a woodworking masterpiece in your garage, or hanging a picture, it's an indispensable tool. Unfortunately, if you don't know how to read it properly, it can be a source of frustration and a waste of valuable time. Tool Pro Leon A. Frechette has written an award-winning article titled "Learn How to Read and Choose a Tape Measure." In this article you'll learn how to read a tape measure properly, how to decode its markings so they can work for you, and how their correct use can help save time. The article covers such topics as, Types of Tape Measures, Increments, The Scale, Other Markings, Truss Example, Tip (end hook). "Learn How to Read and Choose a Tape Measure" received the 2008 Vaughan/National Association of Home and Workshop Writers (NAHWW) Golden Hammer Writing Award in the Internet Category. An added bonus to this article is "Choosing a Tape Measure." Because the tape measure is such an indispensable tool, it's important to select one (or even two) that best fits your needs. This section provides valuable information that will help you better understand what to look for before purchasing a tape measure. Topics include Choosing a Tape Measure, So Where Do You Start?, The Thumb Blade Lock, The Blade, Testing the Blade's Strength, The Blade's Tip, Safety, To Sum It Up. Not only will you learn how to read a tape measure, you'll also get insights into choosing the best one for you. Because this is such a simple—but complex—tool, this 8-page .pdf article featuring 21 full-color photographs provides some outstanding information. "Learn How to Read and Choose a Tape Measure" will help you better understand and use a tape measure to its full potential and how to select the right tape measure to fit your needs. 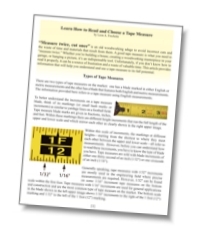 "Learn How to Read and Choose a Tape Measure," am award-winning article written by Leon A. Frechette, a seasoned construction veteran, is a valuable tool for both consumers and professionals. Yes, there's a lot of free information on the web, but none presents the in-depth information as clearly and simply as this article. This award-winning article is definitely worth the investment. "Popcorn ceilings installed as late as 1986 may contain an asbestos level of 3 to 8 percent," says Tool Pro Leon A. Frechette. "It may not seem like much, but inhaling minute asbestos particles can have serious medical consequences. I recommend that popcorn ceiling owners learn the facts and have their popcorn ceilings tested before they begin to scrape it off," he adds. Visitors to asktooltalk.com, Frechette's home improvement web site, can learn how to safely address popcorn ceilings by reading his informative 10-page article, "Asbestos in Popcorn Ceilings." Included in the article are topics such as: What is Asbestos?, Learn More About Asbestos, Obtaining a Sample for Testing, Popcorn Ceiling With Asbestos, Other Options for Dealing with Asbestos, What If Your Popcorn Ceiling Has Been Painted?, Popcorn Ceiling With Asbestos: A Contractor's Removal Procedures, Popcorn Ceiling With Asbestos: Removing It Yourself, Removal Procedures—With or Without Asbestos, Cleanup Following Asbestos Removal, and Finishing Your Popcorn-Free Ceiling. Thoroughly researched, "Asbestos in Popcorn Ceilings" describes the steps a construction professional takes to decide if removal is the correct course of action. Homeowners will want to follow these same procedures as they face the same decisions regarding the presence and removal of asbestos. "Based on our research into the subject over the years and the number of inquiries we receive, it's a major concern to both individuals with older homes and those working in environments with popcorn ceilings," Frechette says. This very timely article is for individuals who want to learn about asbestos in popcorn ceilings and its safe removal. As an added bonus to "Asbestos In Popcorn Ceilings," he's included "Patching a Popcorn Ceiling" to help those who need to repair their ceilings. The process is about the same whether the ceiling contains asbestos or not; however, for your own peace of mind you still need to determine if your ceiling contains asbestos. Patching a popcorn ceiling is a tricky process and is not as easy as it looks. Whether you are just touching up the ceiling texture or repairing a damaged ceiling area, it is difficult to achieve an undisturbed look. However, if you follow what he's outlined in the section under "Patching a Popcorn Ceiling," your project will appear as professional as you'd expect it to be if you'd hired a pro to do it—just a lot less expensive. "Life is uncertain, and the time may come when you'll need to build a wheelchair ramp," says Tool Pro Leon A. Frechette. "You'll want it to be both safe and attractive, since it will probably be attached to the front of your home." Frechette knows what he's talking about. 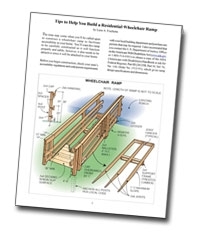 His downloadable five-page article, "Tips to Help You Build a Residential Wheelchair Ramp," delivers clear and concise information along with pictures and construction diagrams. Topics covered include General Ramp Requirements, Handrails, Additional Concerns, and Ramp Construction Techniques. 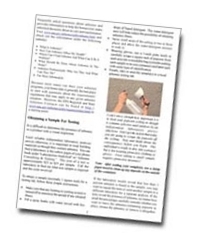 This article offers measurement guidelines and construction diagrams along with construction tips. Those who have purchased the article have found it well worth the price because important construction details and information difficult to find on the internet are all bundled all into one readable package.